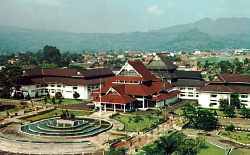 Bandung Regency is verry famous for its beautiful panorama and rich in tourism objects. Agricultural areas surounded by forests, public and state owned plantations, mountain range of Tangkubanparahu, Burangrang and Bukit Tunggul in this the North and the streams of Cikapundung and Citarum rivers, with the legend of Sanghyang Tikoro reminds us of the myth and folk tale of "Sangkuriang", whereas in the South, there is a range of mountains such as Mount Wayang, Mount Malabar and Mount Patuha. floras and faunas, lakes, waterfalls, hot springs, and unique craters like on Tangkubanparahu vulcano. Mount wayang and Mount Patuha which are accessible to visitors. The climate and conditions in West Java are suitable for that purpose. strategic value in respect of economic development, human resource, environment, and also defence and security which constitute one of the basic capital to support the growth rate in Bandung Regency. the preserved areas have the function to support the continuity of the development. whereas some of the preserved areas have the function to support the continuity of the development. During the Fifth Five year Development Plan, 38 districts had been successfully expanded into 42 districts. Administration area of bandung Regency consists of 11 residencies, 1 administrative city (Cimahi), 42 districts, 5 district representations, 22 sub districts and 429 vilages. The construction of office complex centre for Bandung Regency Government Administration in Soreang has improved the work pervormance of government officers. Moreover, the construction of resident and district representation offices has extended and smoothened administration activities and public services. To implement decentralisation principles through the increase in Regency autonomy, authorities submitted to Bandung Regency comprise 16 affairs, including 11 affairs submitted during the first long term development period. The other five affairs are traffic and land transportation ; basic education ; some of health affairs ; plantation and tourism.